another snow day off! i love these unexpected days off. you learn to convince yourself that the weatherman is wrong the night before so you don't get your hopes up. you set your coffeemaker, do your homework(sometimes) and set the alarm...hit the snooze as you usually do, not looking out the window yet.do the very sleepy eye walk to the computer to check your email for the school's out email...and there it was. Schools closed due to inclement weather! i try to sleep but that coffee aroma wakes me up and I know it will turn itself off at 8:10AM. So i'm up at 8:15 for a stale cup of coffee and some jenny time in my studio space. we're in the process of moving me. i need a separate space between painting and sewing. so painting is going in the basement, where it probaly should have been from the get go. I am currently in the master bedroom. so we are moving our bedroom to its rightful place and i will be taking our curent bedroom for my sewing room/office. its very exciting but moving slowly. 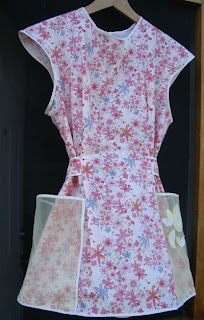 i really want to go back to my sewing machine. 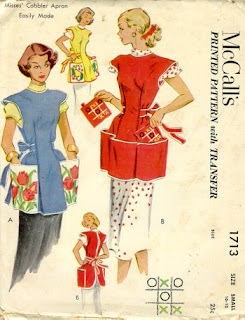 i keep thinking about new apron designs. something faster yet still having that vintage look. i was looking at angry chicken this morning at her tie one on post. 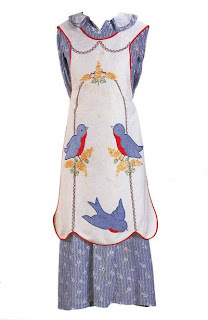 thinking about Joyce Cheney's too expensive to afford book on aprons Aprons-Icons of the American Home. 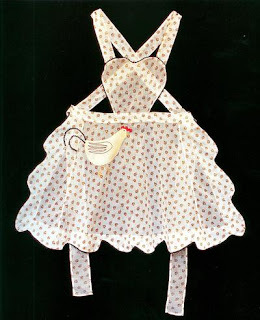 These aprons are my favorites...really love the chickens!